Following the installation of SharePoint 2010 SP2 I noticed a large number of event log errors for the Publishing Cache on web front end servers. The error was “An error occurred in the blob cache. The exception message was “The system cannot fine the file specified. (Exception from HRESULT: 0x80070002)”. In order to resolve the error I went into Site Settings -> Site collection features. I deactivated the SharePoint Server Publishing Infrastructure, then activated the feature. You need to do this out of hours and it does affect your SharePoint site while the feature is deactivated. This entry was posted in SharePoint and tagged Languages, Microsoft, Microsoft SharePoint, SharePoint 2010 on November 11, 2013 by richardstk. Configuring SharePoint 2010 to open search results in a new window requires editing the XSL that determines the search result display. Scroll down and add the attribute for target. 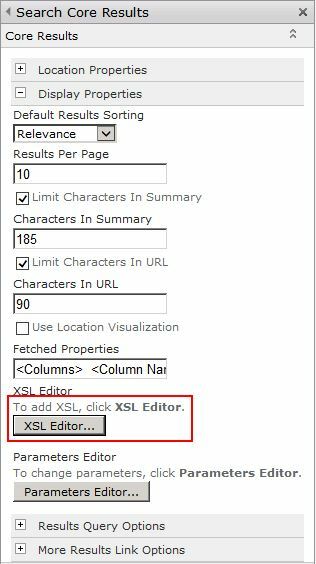 Copy and paste the XSL back into the window in SharePoint. Save and publish the page. This entry was posted in SharePoint and tagged Microsoft SharePoint, Search, SharePoint 2010, XSL on October 25, 2013 by richardstk.